The last Full Moon in Libra represented a point of crisis, an interlude, where everything was on the plate and the personality and the soul were standing in front of each other, but no choice was ready to be made. 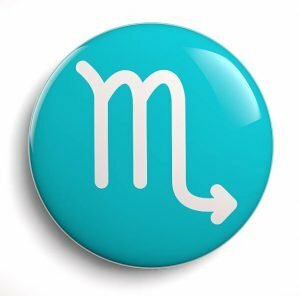 The Full Moon at 21° in Scorpio represents the beginning of a crisis, as this star sign carries the test right down into the physical plane of life. In Esoteric Astrology Scorpio is about the vehicle of rebirth into the consciousness of the soul, but this has to occur through a process of inner/outer struggle and trial for the final triumph. The Sabian symbol for this Full Moon refers to the possibility of displaying one’s inner freedom and prove oneself as an “individual”: obeyng his conscience, a soldier resist orders. This symbol talks about the readiness to face the results of a refusal to follow the old way of being, which was given by the old personality, the old idea we held about ourselves. This means that we will be able to see our own inner patterns and that they will be dissolved by something stronger within the depth of the self: the Angel of Presence or the Soul. 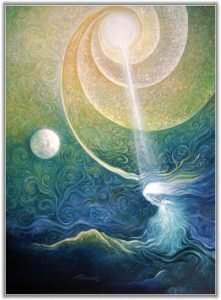 On the other side, the Sabian symbol of the Sun in Taurus will offer a great support to the unfoldment of this inner process because the white dove flying over troubled waters will give each of us the spiritual inspiration to overcome the crisis generated by the Scorpionic energy. Taurus is associated to coral and it delivers the possibility of the rising of the new Christic Consciousness, the soul consciousness that carries the Love/Wisdom aspect. This Full Moon will be conjunct the Fixed Star Zubeneschamali, which is one of the two scales of Libra. The name means “The Full Price” or “the price which covers”, which indicates positive karma. Positive karma is not about a good action, but it means that something will happen that will bring everything back into balance or back on our right path. Karma is always about going beyond the limits of our belief system in order to move into a new space or concept. This star was once considered one of the claws of Scorpio, so the two themes are connected together as they share the concept of prick or sting that we are going to receive if we are in denial of the hidden and darker aspects of the situation we are living. This Star is about facing the veiling darkness and having the courage to plunge ahead into the unknown by trusting our faith and intuition. 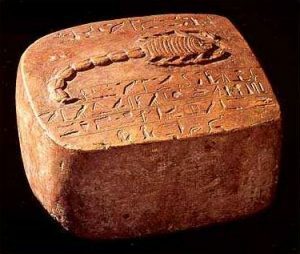 The ancient Egyptians revered the Scorpion as a potent guardian for souls moving from one world to the other, the death of the old and the power of change in consciousness. Scorpio is about spiritual awakening and transformation, as it brings about a clean break for a new vision to rise to the surface of our conscious mind. The Sun and the Moon will create an interesting configuration with Pluto at 19° in Capricorn. Pluto, the ruler of the underworld in classical mythology, vehicles the energy of Ray 1 of Will and Power, which is about destruction and the ending of cycles. The purpose of this ray is to produce the death of desire, when desire has fulfilled its work; it is about detachment and the rising of a clear vision of the new so that a new door may be opened. Pluto is conjunct to the asteroid Juno, that is considered to be one of the stages of the spiritual transformation of the Mystic Way (Purgation, Illumination and Union), with the other three Goddesses Ceres, Vesta and Pallas Athena. 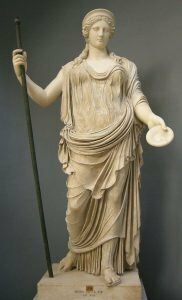 Ceres, the Goddess of Agriculture, corresponds to the process of awakening; Vesta, the Goddess of the Sacred Flame, to the process of Purgation; Pallas Athena, the Goddess of Wisdom, to the process of Illumination; while Juno, the Goddess of Marriage, is associated to the principle of transcending oneself in order to achieve the mystical union. We have been talking about the new coming into our lives, but we cannot go beyond the door if we do not get rid of the aspects that are no longer part of us. In esoteric numerology we add the number of the month and the year in order to reveal the numerological vibration of the month. 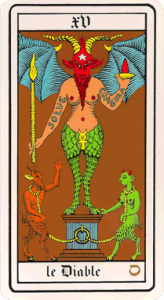 So this May carries the energy of 15/6, which is associated to the Tarot card The Devil. The word Devil comes from the Greek diaballein, which means the one who divides. This number is called Angel or Devil, referring to the Choice, which has to be made in relation to being true to ourselves. The Way is unity, the inner marriage between the personality and the Soul, and the only way to achieve it is by Truth, which always rests on Love. We have to understand what we have been and what we really are in order to free ourselves from the chains of our own little mind and conditioned patterns. The time has come to be true to whom we really are. We cannot lie to ourselves anymore and keep us separated from our Soul. The opening of this inner door will lead us towards the celebration of the inner mystical union and the triumph of our own Soul.